Let’s just say this very quickly – I may have killed the Queen in hive 1 when I removed the super-structure. 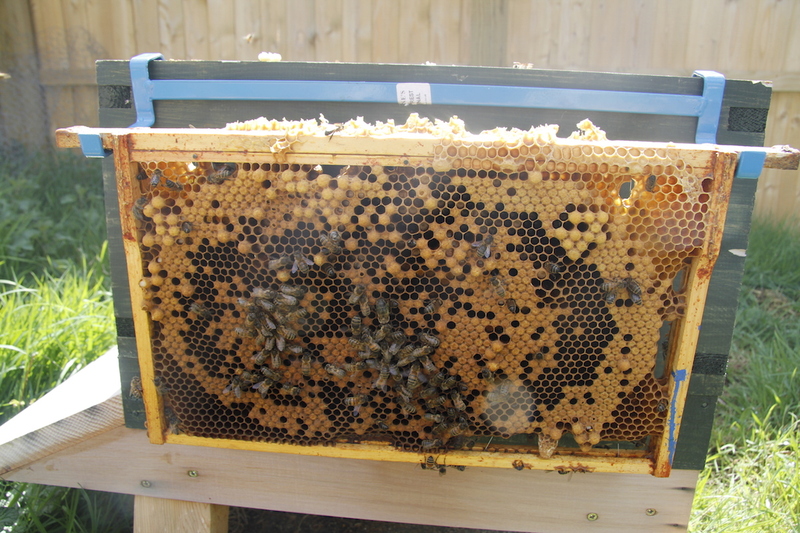 Really we don’t need to go into details – I am a bad bee keeper – but it is likely she was in the superstructure (as there was brood in there) and I only put the bits with honey in back on top of the hive in a super – I left the rest outside, assuming the bees would fly back in. 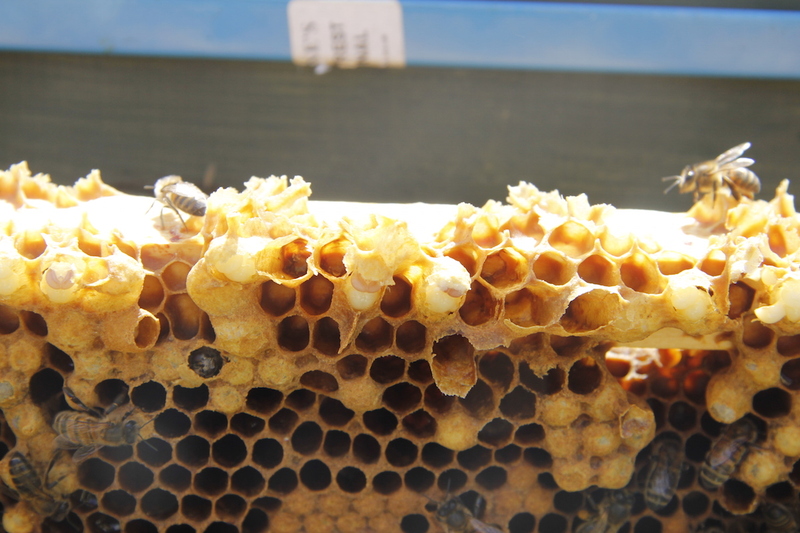 Who knows what happened – all I know is that when I next checked, there was sealed brood but no larvae (thus no sign of a laying Queen) and there were sealed Queen cells – the bees seemed to think they needed a new Queen pretty smartish! Down with the Republic – hope a new Queen is in residence! I have sorted it (got rid of the other Queen cells) and am leaving well alone for three weeks hoping that a new Queen emerges, mates and starts laying. 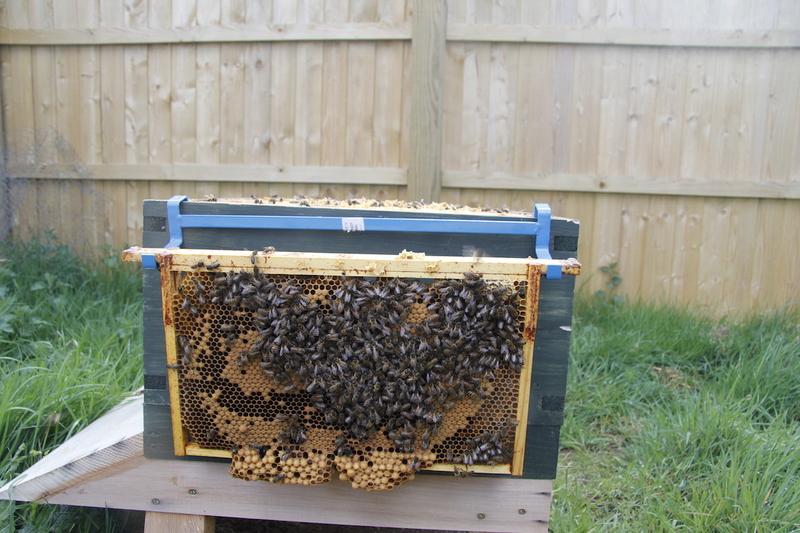 Anyway, yesterday lunchtime I decided to check hive 2. It was full of bees and there were 7 frames of brood in all stages and a couple of frames of honey – the frames in the super had not been drawn though. There was some drone brood that should have been capped, but wasn’t. I had a quick look for varroa mites but couldn’t see anything very obvious. And then I found the Queen cups – the Queen cups with larvae in waiting to be sealed – uh oh they were preparing to swarm. I finished looking through and went back to work – I have an article deadline at the end of this week and there are some things swarms have to wait for! In the evening, about 6pm I decided to do an artificial swarm. 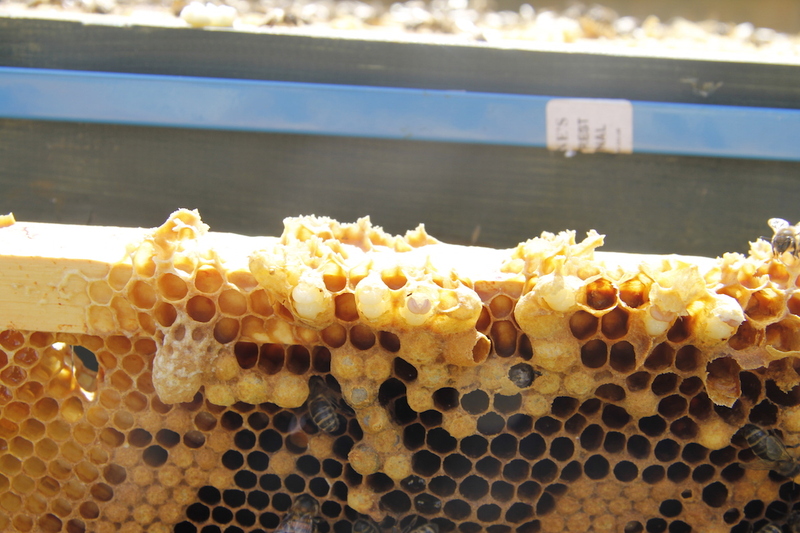 I went back to the hive and meticulously (OK as meticulously as a bad beekeeper can be) went through all the frames. I couldn’t find the Queen. She is unmarked as is the result of an artificial swarm from last year and I am spectacularly bad at spotting her. I have only ever seen her once. What could I do? In the end I attempted the ‘artificial swarm when you can’t find the Queen’ maneuver as outlined in the brilliant Haynes Manual of Beekeeping. 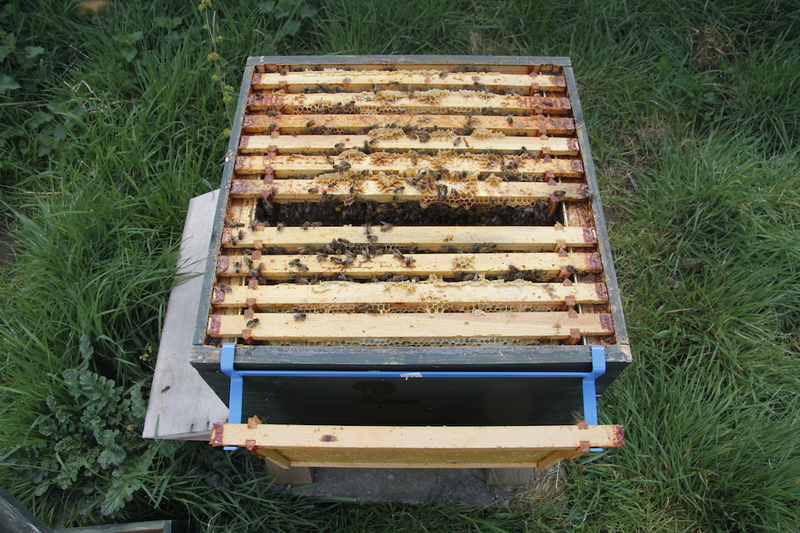 In this way instead of just moving the Queen on a frame – you move all the bees into a new brood box (with new frames and one old frame of brood – no Queen cells) and then put Queen excluder and supers on and then put the old brood box on top. Please let me have successfully moved the Queen and not left her outside or behind again! Update: I just went and took the old brood box off the top and moved it to its new location (front left in the photo above). 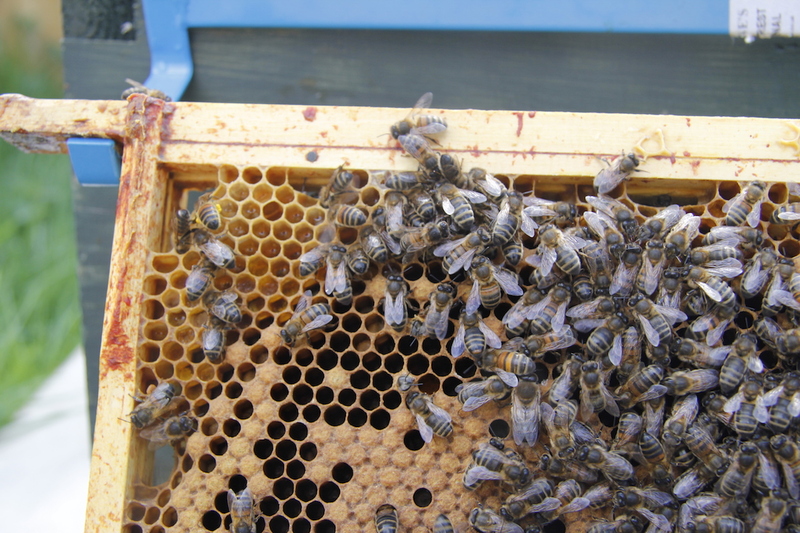 I checked quickly the one frame of brood in the new brood box (now Hive 3) (front right) and there pomming about as if she didn’t have a care in the world was the original Queen from Hive 2 (now Queen in hive 3) – are you following me? I am very confused, but hopefully in a few weeks a new Queen will emerge in hive 2, mate and start laying. I am learning a lot and my head hurts! And yes, I do intend to try and mark my Queen next time I see her! All hail to the Queen! (and her dedicated novitiate beekeeper!) I bow down to your efforts and devotion. Don’t blame yourself. These kinds of things happen to the best of beekeepers (not that I myself am one of them). 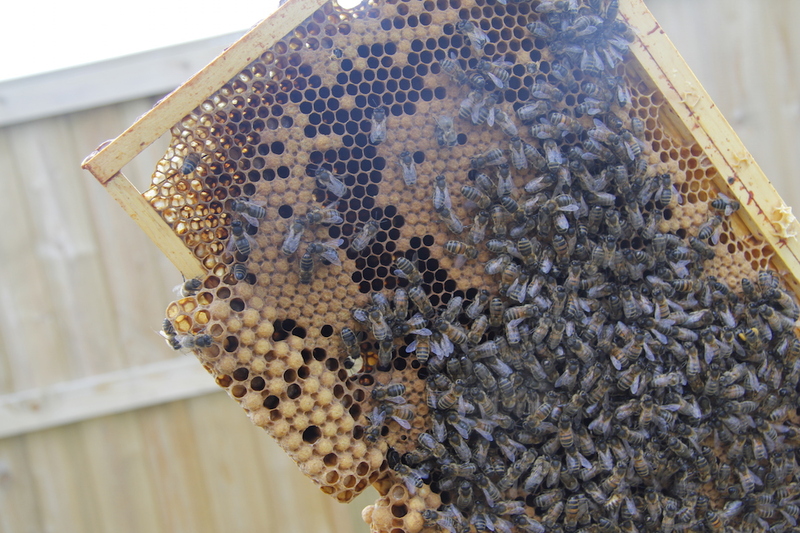 I’d say brood plus queen cells are often a sign that a swarm is on the way, and that the now ‘old’ queen has stopped laying in preparation for the move. On the up side, you have an extra hive, er, right? Oh, I didn’t think of that – it being quite early in April when it all happened. Maybe they have swarmed? I have been leaving them alone so the new Queen has time to hatch and mate – will check it next Monday. 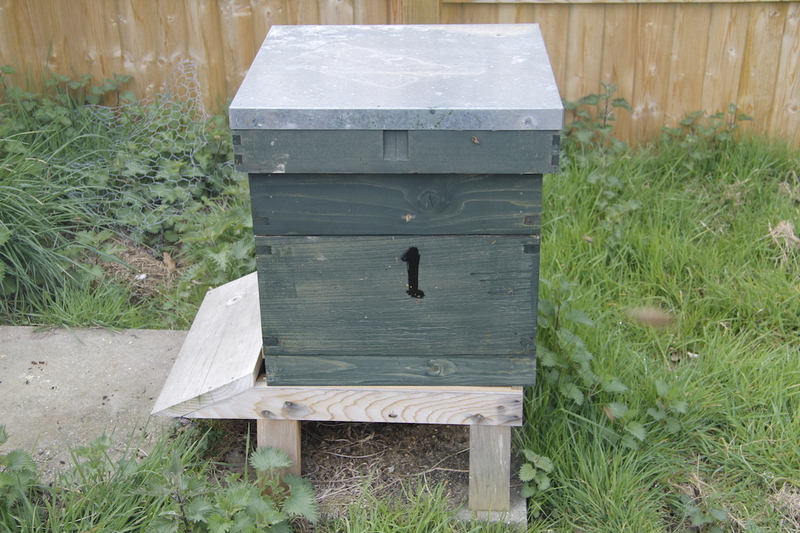 I do have a spare hive – only just though. 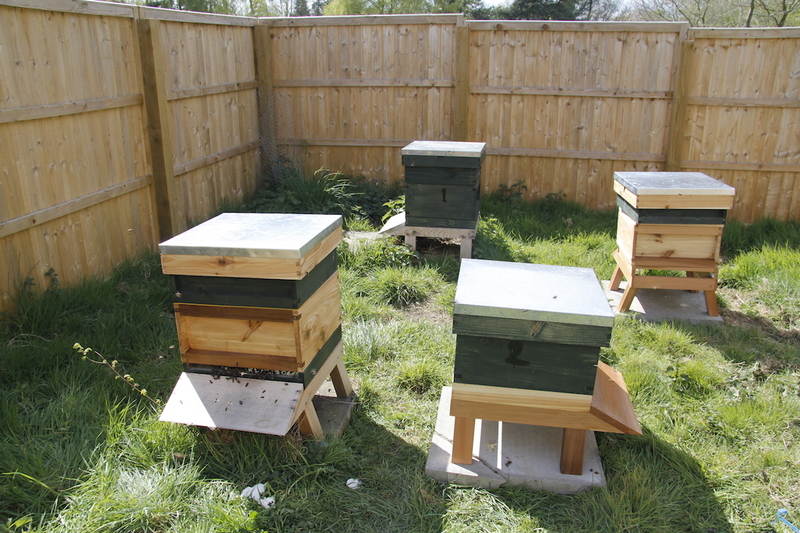 I am rapidly learning that you can’t have too many empty hives! I am learning a huge amount about bees – but mainly have realised how little I know! I hope I get honey this year!